Both my husband and I are fond of mushrooms. Once in a while I make some mushroom dish using the store bought button mushrooms which are so easily available. 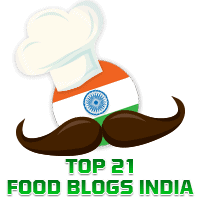 Elsewhere in this blog, you will find recipes for mushroom dishes as diverse as Tandoori Mushrooms, Mushroom Pepper Fry, and Schezwan Mushrooms. Today's dish is adapted from Spicy Garlic Mushrooms in Swasthi's Indian Healthy Recipes. You will love this dish if you like garlics as much as we do. We enjoyed this spicy and tangy mushroom dish with a garlicky flavour, as a side dish with fried rice. Oil, 1 and 1/2 tbsp.